BILYUN-BILYONG PISONG HALAGA NA GAMIT NA EROPLANO NG TIWALING SANGGUNIAN ..
INC leaders using planes worth billions of pesos? EXCLUSIVE: The price of a huge Airbus ranges from P8.8 billion to P11 billion, while an executive jet costs about P3.6 billion. These aircraft are being used by the Iglesia executive minister in his pastoral and personal trips abroad, Rappler learns. MANILA, Philippines – Flying in style? 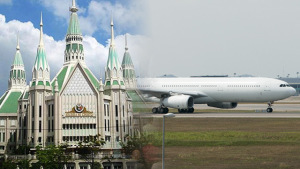 Why are the Iglesia ni Cristo (INC) leaders using an ostentatious Airbus 330-202 and a Boeing executive jet that cost billions of pesos? The price of a huge Airbus ranges anywhere from P8.8 billion ($200 million) to P11 billion ($250 million). It is being used by INC executive minister Eduardo Manalo in his pastoral and personal trips abroad, informed sources confirmed to Rappler. Previous Previous post: PAGKAKATIWALAG KAY KAPATID NA MARCO ERANO MANALO KWESTYUNABLE SA IBANG MGA KAPATID. TANONG BAKIT NGA BA ISINAMA?